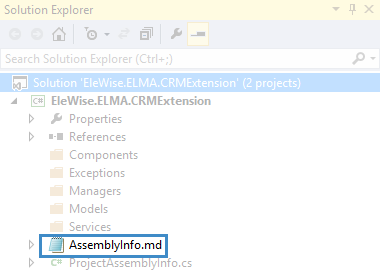 Before creating a module, please read Creating module in ELMA. Events – tools for processing system events allow you to create even more complex extensions for the system. 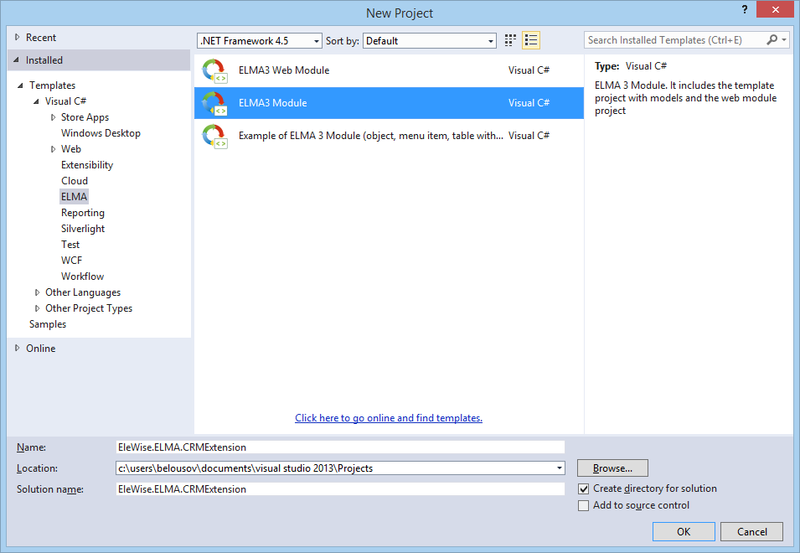 To create a new module you can use ELMA plugin for MS Visual Studio 2010/2013. The module’s structure is the same for both versions of VS. The module samples, attached to this article, were created in the VS 2013. EleWise.ELMA.CRMExtension – is a server module and EleWise.ELMA.CRMExtension.Web – is a web module. Before specifying the data, you need to add a reference to the EleWise.ELMA.Security assembly. Mark Name, Author and Date created properties as required. Add ITN and ICE properties (String type). After that, go to the Additional tab and choose the Generate Filter option in the Filter Settings section. As you can see, EntityManager takes two parameters: IMyCompany and long. IMyCompany is an interface. When we create a new entity in ELMA Designer, the new interface is generated according to the properties that we added to the entity. The second parameter long – is a type of the entity identifier. 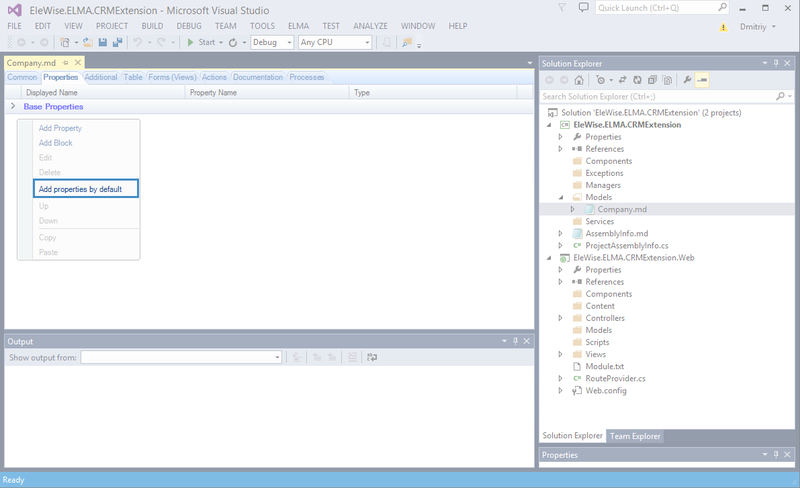 The EntityManager base class already has the required methods for creating, saving, loading and deleting entities. 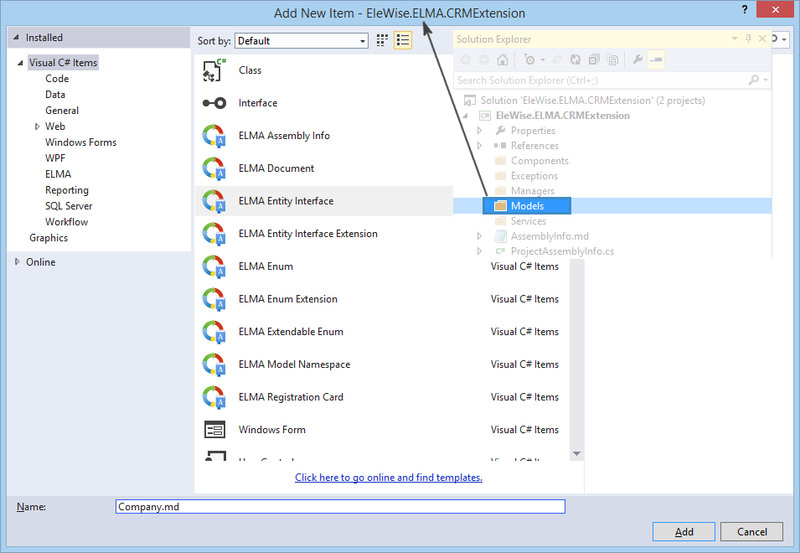 Call the Create() method of the ELMA.Model.Services.InterfaceActivator class. In this ‘manager’ class you should define all methods for working with the entity. You can get the global instance of manager from anywhere of the system using the Instance static property. By the way, you can override it to return the manager of the required type. Permissions to edit companies’ information (only the user, who created the company will be able to edit it). On this level, you assign permissions to access different entities (in this case, permissions depend on the value of the Author field). LocalizedItemsCategories – is a property that returns localized names of categories. You can learn more about module permissions in this article. At this point, the server module is created. You can proceed with creating a web module. 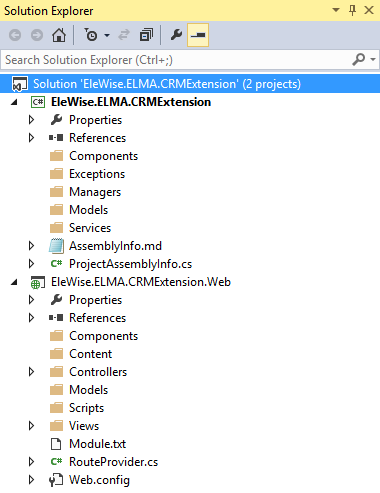 When you create a server module, you need to move the compiled .dll assembly to <ELMA>\Web\bin and restart the server. 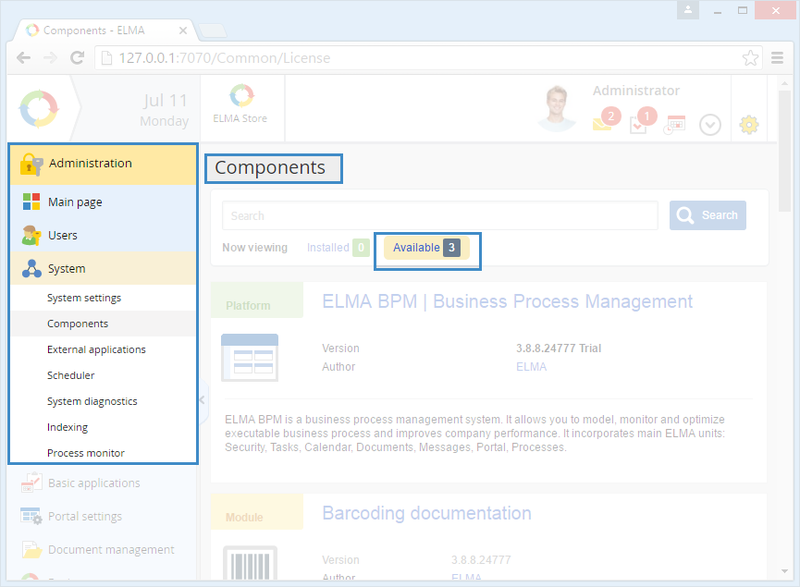 To enable the installed module, go to the ELMA web application – Administration – System – Components – Available tab. Find your module in the list and enable it. After that, ELMA server will be restarted.